A Middle Tennessee firearms trainer who made an ominous comment about killing people in a YouTube video that gained national attention this week has had his handgun carry permit suspended Friday by the Tennessee Department of Safety and Homeland Security. James Yeager, 42, had his permit suspended based on a "material likelihood of risk of harm to the public," the department said in a statement. Col. Tracy Trott of the Tennessee Department of Safety said it didn't take him long to reach a decision after viewing the comments on the Internet. "I watched it twice to make sure I was hearing what I thought I heard," Trott said. "It sounded like it was a veiled threat against the whole public. I believed him. He had a conviction in his voice, and the way he looked into the camera, I believe he's capable of a violent act," Trott said. Yes, .... and another article which includes a few of his originals. As we live in a free market, and the NRA would like to have a 'piece' (no pun intended) of that .... and since their efforts to blame gun violence on video games (as well as "the bad guys") has been seen through anyway ...... they have now launched a shooting game. The app includes what it calls “9 true to life firearms,” and allows players to download an MK-11 sniper rifle setting for 99 cents. The rifle can shoot 750 rounds per minute. 750 rounds per minute is exactly what America needs ..... 'cuz the 2nd amendment and all that, ya know? freedom, liberty, rights, etc. Nah, I will pass.....too expensive! Damn ammo price has gone up two to three times! 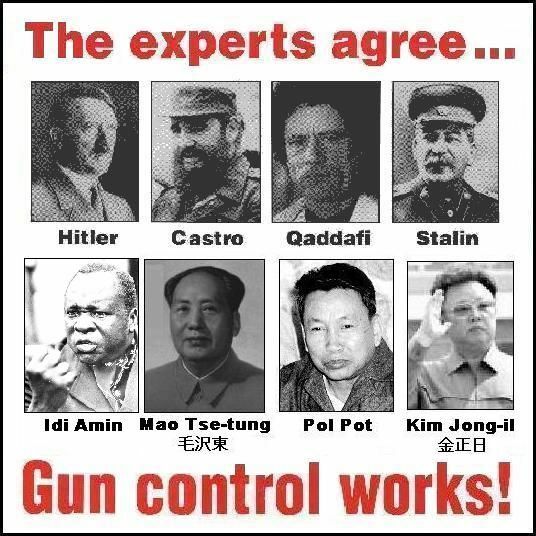 All the experts agree on gun bans. Maybe living with the realization of how little freedom fom government in the old country was what caused the Founding Fathers of the United States to adopt these rules in order to protect US citizens from the tryanny of their own governments in the future. If the Constitutional law of having your own and keep weapons to defend against the power of government needed the fourth amendment about siezure & the breaking of the third amendment in order to triple down on the breaking of the second amendment. Odd that so many of these were overthrown by force, either internally (25%) or war (25%). The right of the people to be secure in their persons, houses, papers, and effects, against [b]unreasonable searches and seizures, shall not be violated, and no warrants shall issue, but upon probable cause, supported by oath or affirmation,[/b] and particularly describing the place to be searched, and the persons or things to be seized. Also all three may be removed by a vote to do so by a majority of the legislators representing 2/3 of the states. But they all have a commonality that caused severe hardship, cruelty of government over the people they became dictators over because the folks were unable to understand where things were going when the original bans took place . The actions are reenacted and some folks will gladly give such killers the reins one peg at a time. In the mean time death camps and grave yards become filled with dissidents who tried to turn back the dictators before they got that power and generations of folks became slaves to the dictators who had all the weapons. No, that is just propaganda. Hitler did not ban guns, but there were controls in place before he was elected and given the powers. In fact, the 1938 gun control law so often mentioned reduced the restrictions on ownership for most Germans over the previous laws starting after WWI when there were restrictions placed on Germany by the Treaty of Versailles. Gun control is claimed in these cases but I have seen little independent information to confirm or deny them. Snopes has been researching the same claims for over a month now too. LaPierre took home $960,000 from the NRA and related organizations in 2010; Kayne B. Robinson, the executive director of general operations, earned more than $1 million. The irony is that these "experts" were supplied arms by military powers, including those that worked with the U.S. and aren't mentioned. Not surprisingly, the same arms industry is behind lobbying against gun control but also lobbying for arms exports deregulation while providing more formidable armaments to police and military forces, including those that work for these "experts." When the second world war broke out The Brits were training their home front with broom handles because they had no weapons to defend themselves with. They begged Canada , Austraila & the US for any type of weapondry they could supply. That is what happens when folks do not prepare as a country or as a man in his own castle or work place for defending yourself from an invasion of bad people. This seems to be factual Ralfy. What, do you think, are the implications? this is true, but the fact the army left all of its equipment in France when it evacuated does make a significant difference. Even semi-automatic weapons would not be much against artillery and heavy machine guns. The government working with the financial elite will engage in various false flags for various reasons, which includes testing the waters to see how the public will react to tragic events involving firearm use. These include attempts at gun control (which may be irrelevant because U.S. military and police forces, not to mention prison and surveillance systems, are already strong), note reactions in the form of more gun sales, note percentages of citizens calling for more security, etc. Eventually, beefed-up military and police forces with ground-attack aircraft, drones, artillery, bombs, armored vehicles (all paid for by the public), will overwhelm citizens armed with small arms. Thus, citizens will be controlled ironically with the same armaments that they think will protect them from a government armed by the same source. Eventually? Why not now since the military has a huge weapons advantage since WWII? The general population has no defense from air attack (either tactical ground attack or strategic bombing), no counter for artillery, little counter for armored vehicles outside of suicide attacks, no organization, no squad level heavy weapons, and even insufficient small arms of military caliber. This has been the case since the end of the Civil War, but moreso since the end of WWI and even more after each technical improvement created by each successive conflict.